The collapse in the Syrian pound has accelerated dramatically in recent weeks. Businessmen whose interests are tied in with the Assad regime’s survival are getting increasingly anxious, fearing the exchange rate is now beyond Syrian government control. In March 2016 the Syrian pound traded at around 440 to the US dollar, now it is 650 and rising daily. Before the war began in 2011 it was 47 and had been stable for some years. The collapsing pound seems to directly mirror the collapsing confidence of merchants and traders once loyal to the Assad regime. Many are buying dollars with their profits and quickly transferring them to bank accounts abroad. Meanwhile Western Union, the accepted method for relations and friends abroad to transfer foreign currency into Syria, has for months only been allowed to pay out currency from abroad inside Syria in local cash. For Syrians on the government payroll – a staggering 2.7 million people or, even more staggering, roughly 35% of the population now living in the regime-controlled areas – this is a disaster. Life is becoming impossible. A friend who is head of one of the state-run banks in Damascus has been telling me that her monthly salary enables her to feed the family for two days only. More and more people are being forced to sell possessions and property; many are making the decision to abandon ship and leave, even though they know their chances of employment elsewhere are miserable. Neighbouring countries and Europe will inevitably feel the pressure of more refugees. The reason behind the quickening collapse is thought to be twofold: firstly Russia’s reluctance to back Assad with full air strikes in the regime assault on Aleppo, which has led to another stalemate instead of the quick victory they had hoped, and secondly a new World Bank report estimating Syria’s foreign reserves to be a mere $700 million, down from £20 billion before the war. ISIS has recently recaptured oilfields around Palmyra, increasing pressure on the regime’s ability to provide electricity to the capital. Income from taxation has plummeted as 80% of Syrians now live below the poverty line. Recruitment rates into the Syrian army are minimal, as more and more young men leave the country rather than be fed into the war machine. Peace talks are planned to resume in Geneva in the coming weeks. Bashar al-Jaafari, Assad’s head negotiator, arrived late at the last round, after first waiting for the 13 April Syrian parliamentary elections to be completed. Although the Syrian parliament is impotent under the current Syrian constitution and the result was a foregone conclusion with the election of regime cronies vetted by the security services, the message to the international community was clear – the Assad regime is the only legitimate government of Syria. The propaganda value to the regime of Palmyra’s recent recapture in championing this message has also been key. Foreign journalists, normally denied visas, were suddenly invited in and bussed across the desert to photograph the fabulous ancient ruins, still 80% intact, that lie between Syria’s largest oasis and an extinct volcano – the perfect romantic backdrop to Assad’s rehabilitation as national hero valiantly fighting ISIS terrorism. 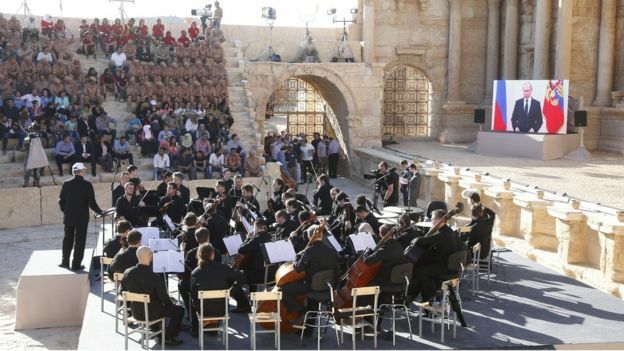 The Russians then bussed in a further round of journalists to witness the absurd spectacle of a Russian orchestra playing in Palmyra’s theatre, with President Putin appearing live on a stage screen to congratulate all involved in the victory. Palmyra was the crown jewel in Syria’s tourism industry and its restoration is scheduled to be the flagship project for rebuilding Syria. The opposition in exile and even the officially-sanctioned domestic opposition have dismissed all such stunts as ‘illegitimate’ tricks to gain leverage in the peace talks. The PYD, the largest grouping of Syrian Kurds, who are busy consolidating their semi-autonomous cantons in the north, have also dismissed the PR campaign. So far they not been invited to the Geneva talks, for fear of upsetting the main Turkey/Saudi-supported opposition. Syria’s peace envoy Staffan de Mistura is putting a brave face on all such complications, stressing that the peace talks are “flexible”. 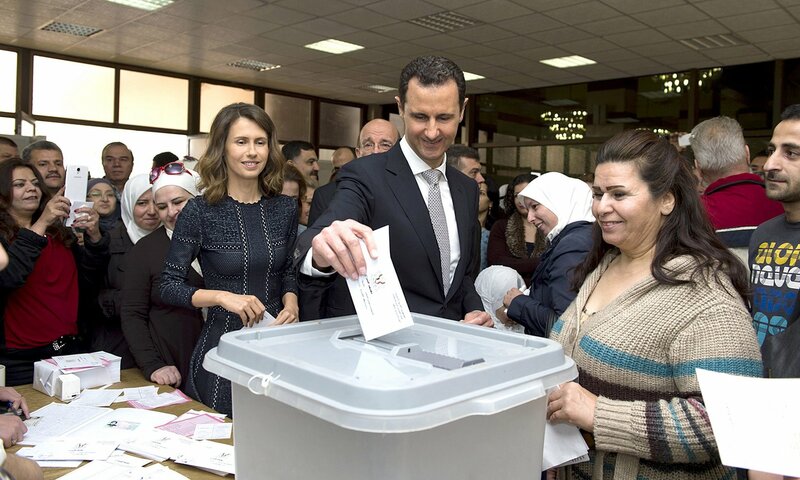 His optimistic aim remains to achieve a political transition by August and UN-supervised elections within 18 months, where all Syrians can vote, even the diaspora, be they penniless refugees or wealthy businessmen. The upcoming US change of president in November is another pressure on John Kerry and the Obama administration to try to broker a Syrian political settlement with Russian help in the coming months. The big question remains whether Assad will agree to negotiate his own exit, given all the mounting pressures, especially if it becomes clear his traditionally loyal inner elite are ready to sacrifice him. More likely in my view is that his skilful team in Geneva will simply continue their policy of appearing to offer national unity and reconciliation, even though their survival is at the expense of the entire country.